(Nanowerk News) The sun ejects a continuous flow of electrically charged particles and magnetic fields in the form of the solar wind -- and this wind is hotter than it should be. A new study of data obtained by European Space Agency's Cluster spacecraft may help explain the mystery. The solar wind is made of an electrically-charged gas called plasma. One theory about the wind's puzzling high temperatures is that irregularities in the flow of charged particles and magnetic fields in the plasma create turbulence, which, in turn, dissipates and adds heat to its surroundings. Using two separate sets of data sent back by Cluster, an international team of scientists has probed the spatial characteristics of this turbulence in more detail and at smaller scales than ever before. They saw evidence that the turbulence evolved to form very small “current sheets” -- thin sheets of electrical current that separate regions of rotated magnetic field. A 2-dimensional vision of the solar wind turbulence at the smallest scale seen yet, thanks to observations by Cluster satellites. The approximate location of the measurements is indicated on a graphic illustrating features of Earth’s magnetic environment. The inset shows conditions as would be seen facing the solar wind, with current sheets forming at the border of turbulent eddies. The trajectory of the Cluster spacecraft is marked on the inset by the black line and the color gradients represent the magnetic field strength intensity. “For the first time, we were able to obtain direct evidence for the existence of current sheets at these very small scales, where dissipation of magnetic energy into heat is thought to occur,” said Melvyn Goldstein, project scientist for Cluster at NASA’s Goddard Space Flight Center in Greenbelt, Md. Goldstein is a co-author of a paper on these results that appeared in the Nov. 9, 2012, issue of Physical Review Letters. This solar wind is a non-stop gale of plasma, mainly protons and electrons, which originates in the sun’s searingly hot lower atmosphere. It blasts outward in all directions at an average speed of about 250 miles per second. The outflow is so energetic that it pulls along the sun’s magnetic field. The solar wind travels across the entire solar system, until it reaches the boundary with interstellar space. The plasma cools as it expands during its outward journey. However, the amount of cooling is much less than would be expected in a constant, smooth flow of solar particles since the density is so low that the particles cannot be receiving extra heat from the most common method on Earth: collisions. By providing the first observations of these small current sheets, the Cluster data help confirm that such sheets may play an important role in the dissipation of the turbulence – meaning that as the turbulence cascades from larger disturbances to smaller ones, energy is taken out of the magnetic field and added to its surroundings as heat. The current sheets are more or less two-dimensional. They may are also be sites where the magnetic field lines reconnect and break, resulting in a transfer of energy to both particle heating and particle flows. Such magnetic reconnection occurs in many regions in the universe including in the solar wind, inside the sun and other stars, and in Earth’s magnetic environment, the magnetosphere. 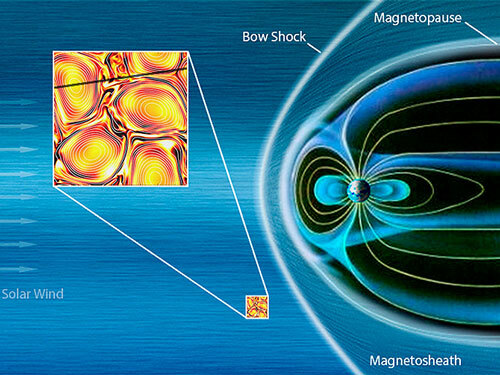 Finding direct evidence for magnetic reconnection at these scales is difficult with the present instrumentation, however, and resolution of that question may have to await the launch of NASA’s Magnetospheric Multiscale (MMS) mission in 2014, a mission that will focus on reconnection in the magnetosphere. The team’s study made use of the high time resolution of the Spatio Temporal Analysis Field Fluctuation (STAFF) magnetometer, which is carried on each of the four Cluster spacecraft. STAFF is capable of detecting rapid variations in magnetic fields, which means that very small spatial structures can be recognized within the plasma. The scientists examined two sets of STAFF observations. The first data were obtained on Jan. 10, 2004, when two Cluster spacecraft (C2 and C4) were separated along the solar wind flow direction by only 12 miles apart, while the two other spacecraft were much further away. At that time, STAFF was operating in rapid burst mode, during which it recorded 450 measurements of the magnetic field per second. Additional data were obtained by a single spacecraft (Cluster 2) on March 19, 2006. "During the 2004 observation, both spacecraft were so close that they observed almost simultaneously the same structure in the solar wind as it passed them by. The magnetic field data showed the typical signature of a current sheet crossing," says Silvia Perri of the Università della Calabria, Italy, who is the lead author of the paper. At that time, the solar wind was flowing at about 350 miles per second. The current sheet event lasted only 0.07 seconds for both satellites and this corresponds to a spatial size of about 25 miles.